Hi everybody! It’s me, Sophie! I’m sorry I haven’t been here in a while, I lost track. Anyway, I’ve got some great news! :D On June 20th my family and I will be going to Disneyland for the 1st time in our lives!!!!! So, I’ve written a blog post about what I’m looking forward to the most at Disneyland. Well, here it goes. What I’m looking forward to the most at Disneyland is the fun of being there for the first time in my life. There are some things at Disneyland that are original, that only Disneyland has like “Roger Rabbit’s Car Toon Spin” and Mickey and Minnie’s actual home town, not just their vacation homes. Besides there is a bunch more like “Cars Land” and “Critter Country” and stuff like that. Then there is “Buena Vista Street”. The statue of Walt Disney and that famous mouse has Mr. Disney’s story about how he found himself destined to make Disneyland and WDW. It’s so interesting to me. Then there’s “Paradise Pier” which, in my opinion, should be called “the land of non-stop summer”… or at the very least nicknamed. Of course there is Sleeping Beauty Castle. It is one of my top missions to watch the fireworks go off from behind the castle in the best place possible! 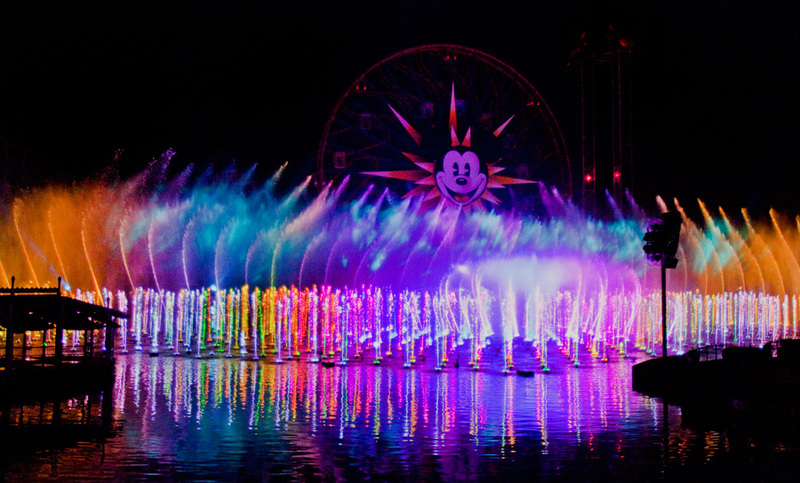 Then there is the World of Color, the most beautiful scene in California (click the link to see the premier party video for World of Color). I think it would be cool to see it from Mickey’s Fun Wheel too. It would look so pretty from above. It looks beautiful in the picture above and that’s from a side view! Well I hope you liked it. 7 Days til Disneyland – Tower of Terror! The closer we get to our trip to Disneyland, the more I feel like I’m in a slow motion countdown for a Space Shuttle launch! Today is Day 7, and today we are taking a look at the Twilight Zone Tower of Terror, located at Disney’s California Adventure park in the Hollywood Land section of the park! I’ll be brutally honest with all of you — this is one of my LEAST favorite rides at Walt Disney World, so I totally expect that I will probably not like it at Disneyland either! I imagine that I will ride it once, then sit around and people watch while my wife and daughter ride it a couple of more times without me! So tell me, who out there is a big fan of the Tower of Terror, and why? For those of you, like me, that don’t care for it as much, why not? Maybe we can start a support group or something like that! Thanks for stopping by on our journey towards our trip to Disneyland! If you have missed out on any of the excitement that I’ve been describing with some of the posts, check out our 100 Days til Disneyland page for all of the ones we’ve done so far, and thanks for keeping up with My Dreams of Disney!